BERLIN - All Paul D’Amore had to do was wait. 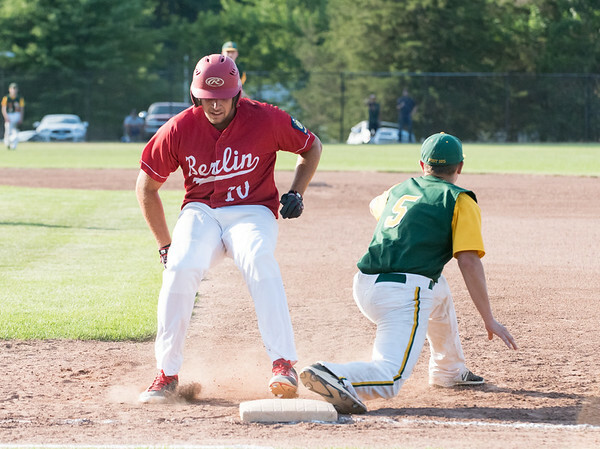 D’Amore drew a bases-loaded walk as the Berlin Legion baseball beat RCP 4-3 to complete an important come-from-behind win at Zipadelli Field Thursday night. Berlin head coach Gary Van Etten was proud of his team all around, especially the offense grinding out a tough win against RCP starting pitcher Brett Thivierge. In six innings of work, Thivierge held Berlin to three runs on nine hits and just one walk. The scoring didn’t start until an RBI-single in the fourth inning from Berlin catcher Ryan Hyde to drive in Gianni Fanelli, who had three hits of his own in the game, including an RBI-double in the fifth. Berlin fell behind in the sixth inning when RCP finally broke through against Matt Vernacatola, scoring three runs to take a 3-2 lead. But Berlin charged back, picking up the tying run on a clutch two-out, RBI single by Connor Guidice, setting the stage for the walk-off win in the seventh. Hyde was relieved of the offense’s ability to squeak by with another win. The decision gives Berlin its ninth win by three runs or less this season. Besides struggling in the sixth inning, Vernacatola was dominant on the mound for Berlin. In a complete-game effort, he gave up seven hits - five of which came in the sixth inning. He also had one stretch of 10 straight consecutive batters retired. Berlin is now 14-5 on the season and two games ahead of RCP for first place in the Zone 7 standings. If Berlin wins either of its last two games, it will clinch the top spot in the zone. Posted in New Britain Herald, Berlin on Thursday, 12 July 2018 20:50. Updated: Thursday, 12 July 2018 20:59.